Pages form the content of your sites. A site can have a single page or many pages. Manage the pages for a site by navigating to the Sites tab on the left-hand navigation of the admin dashboard. Select the site for which you want to manage the pages and click either the title or the edit (pencil) button to edit that site. Once you are editing the site, click the Pages tab in the left hand navigation. When you create a new site, Omeka S automatically adds a page titled Welcome with a single HTML block (see below). You can edit this page or delete it. From the page for the site, click the Pages tab. Then click the Add new page button on the upper left side of the window. To add a page you must enter a Title. You can also enter a URL Slug. Both of these can be edited later but are required to create the page. 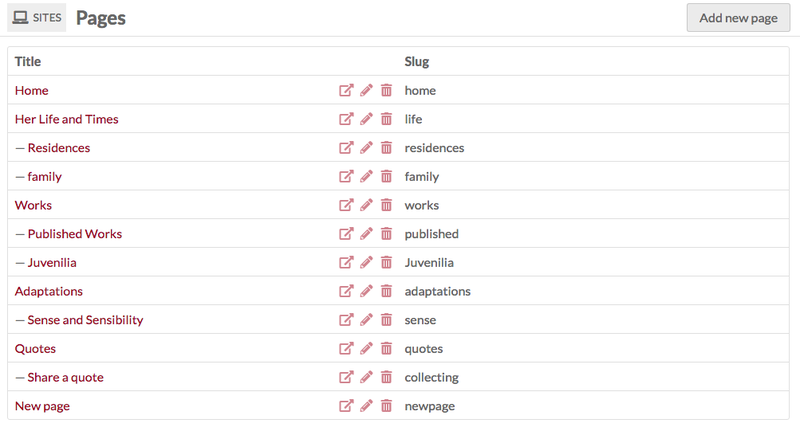 If you do not enter a slug, Omeka S will create one from the page title. A slug is the page’s portion of the url and can only contain letters, numbers, and hyphens; no other characters are allowed. In addition, there is a checkbox for "Add to navigation". If checked, the page will automatically appear at the main navigation level for the site. If you do not check this box, you will have to manually add the page to the site navigation at a later point. Once you have entered this information, click the Add button in the upper right hand corner of the browser window. You will be automatically taken to the edit form for that page. If you decide you do not want to create the page, click the Cancel button. The pages tab (once you have at least one page) will display all of your pages in their navigation order. Child pages will display below the parent page with a - before the page title. Every page is listed with its Title, buttons to view (box with an arrow coming out), edit (pencil), or delete (trash can) the page, and the page's slug. 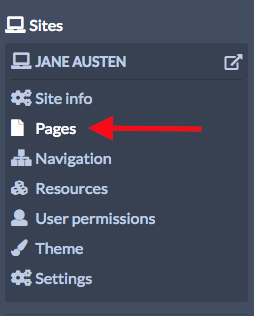 Use the Navigation tab of the site admin to set the order of pages, including setting child and parent pages. Once you have added blocks to your page, click the Save button in the right hand corner. To leave without saving changes, click Cancel. You can delete any of the blocks by clicking on the trash can icon located in the upper right corner of the block. Change the order of blocks by clicking on the three horizontal lines on the upper left corner of the block and then dragging and dropping it to the desired location. If you are on the admin side and click "View" in the upper right-hand corner of a page, it will take you to the public view for that page. As you are browsing the public side of your site, you can edit the page you are viewing if you are currently logged in and the user bar option is turned on in Site Settings. The user bar, which appears across the top of the page, includes a link to edit the current page - circled in red in the below image. Pages are made up of blocks, each of which has a different form of content. Creates an HTML box in which you can add formatted text and links. 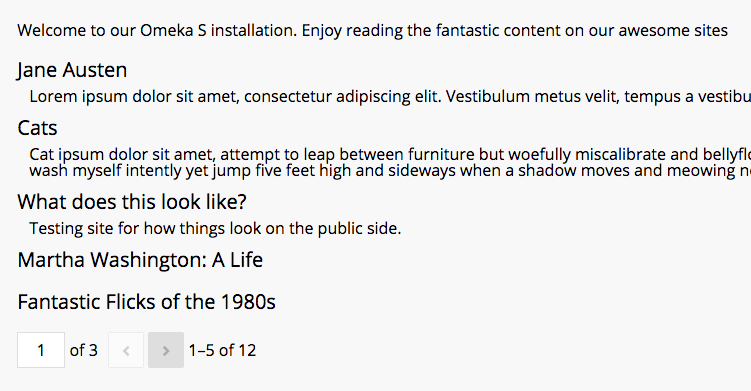 When you click in the box, a formatting menu will display above the text field. Displays the title of the current page. Creates a block with one or more pieces of media associated with items in the item pool. To add media, click the add attachment. On loading, the drawer will show a list of your items, most recent first. 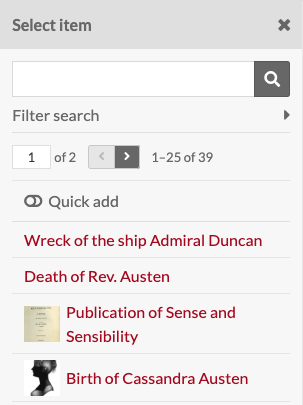 You can select form the first page, page through using the forward and back arrows, or search using the search bar. Once you’ve selected an item, the drawer will shift to that item’s information. You can add a caption and select which media (if more than one) you want to use. To return to the list of items, click the Select item button at the top of the drawer. To use the item displayed and apply the caption, etc, click the Apply changes button at the bottom of the drawer. Thumbnail type: choose from large, medium, and square. Thumbnail alignment: relative to page. Choose from left and right. Show attachment title: Choose whether the media should have a caption of the item title, file name, or no title displayed at all. 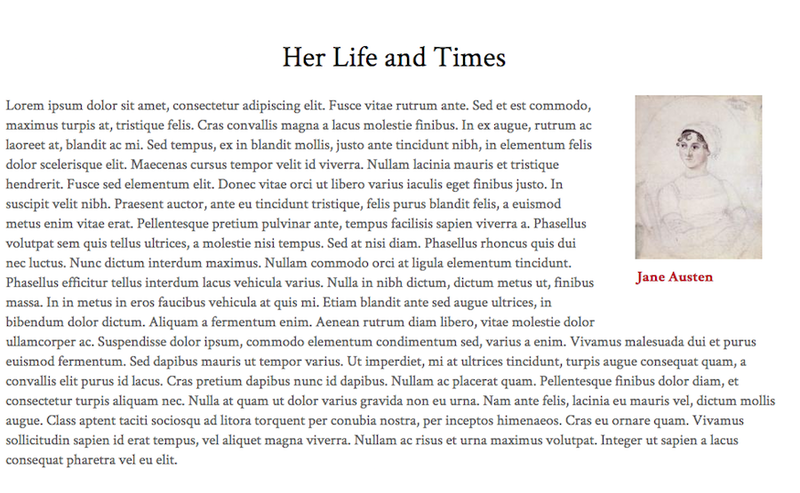 Placing a media block after an HTML block will cause the media to appear below the end of the HTML paragraphs. Allows you to add a block of items on a site page. 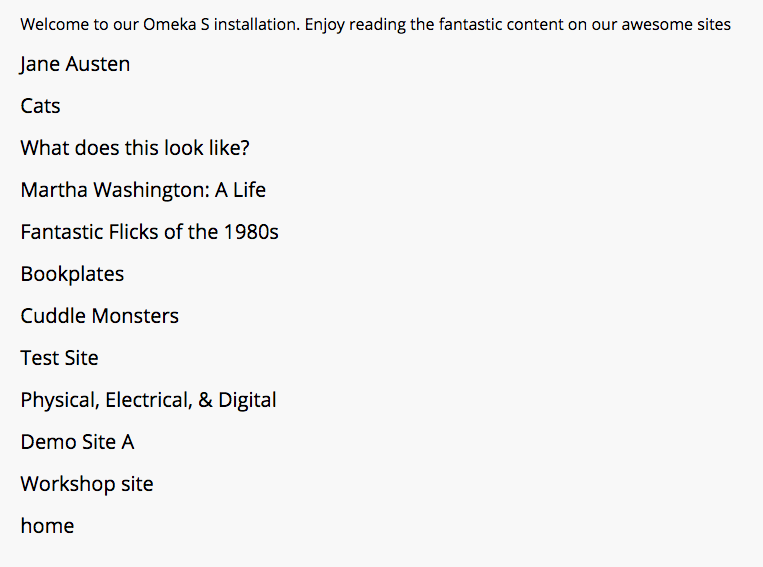 In order to create a Browse Preview block, you'll first need to perform a search on your Omeka S installation for the items you want to include. You can use the general search on the left hand navigation or, if you want to show all items in an item set, use the Advanced Search from Items browse. NB: if you leave the search options blank, the browse preview will load all items in your site's item pool. Once you have searched, highlight everything in your browser's address bar starting with the question mark all the way to the end of the search url (to the right). From the Resource type dropdown, choose the kind of resource you want to display in the block: Items, Item Sets, or Media. In the Query field of the Browse Preview block, paste the part of the url you just copied (everything from the question mark over). The Limit field lets you set the number of resources to display in the block; any additional results from your query can be accessed on a search page linked from the bottom of the block (you set the text of the link in the browse link text field below). The Preview Title field sets the heading above the browse section on the page. The Browse link text field sets the link text at the bottom of the block - the block will only display as many results as you set in the Limit field above. Using the drop-down menu in the block, you can set the thumbnail size for these items as large (default), medium, or square. Click the Add Attachment button to add an item to the block. This will open a drawer on the right side of the page to browse and select items. To cancel the item selection, click the X in the upper right corner of the drawer at any time. Once you’ve added an item, it will appear in the Item List block. You can edit the caption or media options by clicking the edit (wrench) button for that row, and you can delete the item using the delete (trash can) icon. You can add multiple items to the list. Sort sites by: Alphabetical order (A-Z); Oldest first; newest first. By default this is set to alphabetical. Max number of sites allows you to limit the number of sites which display at once. If left blank, all sites will display. A checkbox to turn on pagination, applied only if you set a limit. If the current page has child pages, you can add a table of content block for those pages. The Depth option allows you to set how many levels of child pages you want to display. If left blank, it will display all possible levels. Please enter a whole number. Add and arrange pages using the Site Navigation settings. Line break creates a transparent or opaque line break on the page, clearing all blocks. Select whether the line is transparent or opaque from the dropdown. HTML blocks wrap around Media blocks and at times you may want to clear the page. You might also want to create a visual break on the page. This block displays an item along with all associated metadata (entered when creating or editing the item). Add attachments in the same manner as the media page block. For module-specific blocks (like Collecting or Map) see the documentation for that module. To delete a page, go the to Pages tab of the site of which the page is a part. Click the delete (trash can) button at the right end of the row for that page. A drawer will open on the right side of the page asking you to confirm that you wish to delete the page, with the name of the page displayed under the confirm button. To proceed, click the Confirm delete button. Otherwise, click the X in the upper right corner of the drawer to cancel.